I had to take a minute and share this beautiful dish. This salad was the “recipe of the day” on Epicurious a while back. It looked so beautiful and included all the ingredients we love, it was a must try. Since the recipe called for microgreens it gave me a reason to buy some Blue Moon Acres local microgreens. I used their micro-arugula for this dish. It’s pretty pricey stuff, but it sure takes a beautiful picture and tastes fantastic. I’ve used their microgreens on a smoked salmon platter in the past and it made for a special holiday starter. 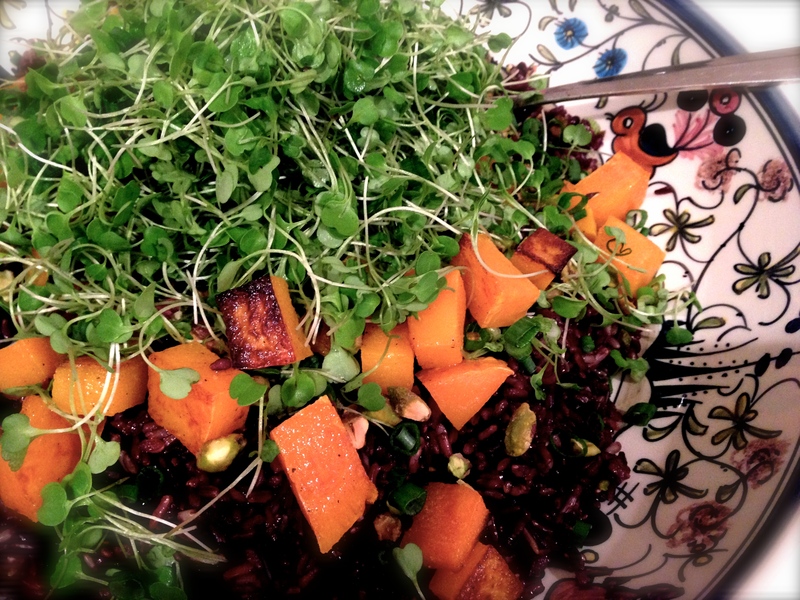 Microgreens have a delicate flavor that dress up any salad. In the summer when our farms are overflowing with fresh picked veggies I love to dice up an assortment very small, toss them with microgreens and a little crumbled feta or blue cheese and voilà! Delish! It’s a quick chopped salad using salad greens that don’t need any chopping. For now, in this freezing weather, butternut squash and rice of all kinds are easy to find. You can, of course, use regular baby arugula for this as well. 1. Preheat your oven to 450 degrees. 2. Cook the rice together in a 4 qt saucepan of boiling water with a pinch of salt until tender – about 35 minutes. Pour the rice through a sieve and allow it to drain completely. Pour the drained rice onto a large platter and allow to cool. 3. Meanwhile, cover a sheet pan with foil and toss the butternut squash with a little olive oil and salt and pepper. Roast in your preheated oven for about 20 minutes until softened and beginning to brown. 4. To make the dressing, whisk the vinegar and honey together and then add the ¼ cup of olive oil, whisking to emulsify. Season with kosher salt and pepper to taste. 5. 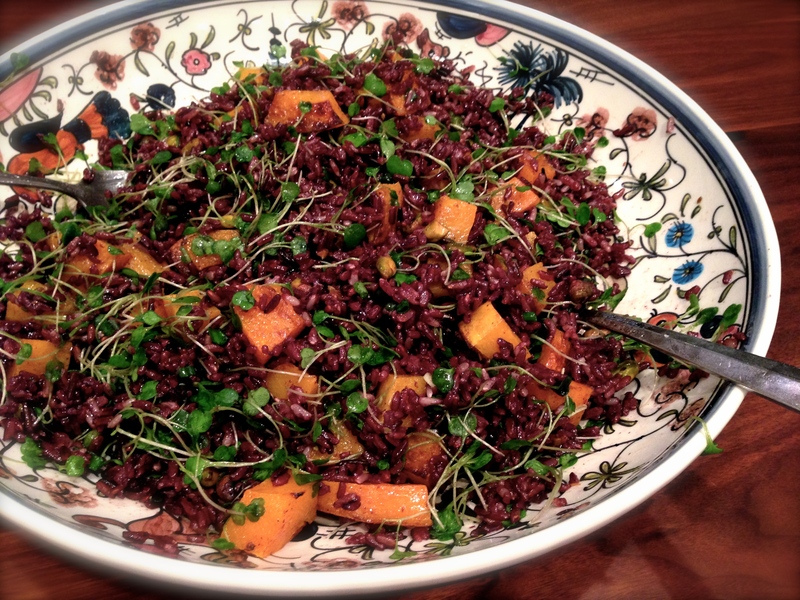 In a large bowl, fold the rice, squash, scallions and microgreens together. Toss with the dressing. Sprinkle the chopped pistachios on top. Nancy, here is the recipe I just received from you posted to my correct email address!